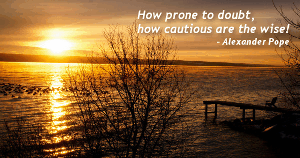 Famous quotes by Alexander Pope - Quoteopia! A cherub's face, a reptile all the rest. Blest paper-credit! last and best supply! That lends corruption lighter wings to fly! But honest instinct comes a volunteer; Sure never to o'er-shoot, but just to hit, While still too wide or short in human wit.